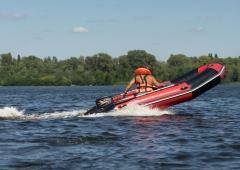 Beluga K series inflatable boats are considered to be the largest and the most stable models at the modern market. This category is characterized with the whole range of special important features which provide safety and comfortable use at the worst environmental conditions up to the waves of 6’7” height. Beluga K series includes the boats of 12' - 14' with up to 2094 lb. payload. Such features in combination with other important technical characteristics are the reason of the widest variety of application. Here is one of the best Beluga K series models description. Beluga 14 ft. Red/Black Inflatable Boat is the largest, steadiest and the most spacious boat of K class. It originally combines high speed and safety. This model of keelboat runs up to 25 miles/hour (this data is actual for 15 horsepower motor use and 4-5 persons onboard). Moreover; you can install 20 horsepower motor on this boat for the fastest riding with 6 to 8 people onboard. 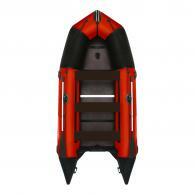 14 ft. Red/Black Inflatable Boat is 14’2” long, 6’3” wide and has 1’9” tube diameter. So, it looks quite solid in comparison with other K class models and other similar boats which are presented at modern market. Beluga 14 ft. Red/Black Inflatable Boat is perfectly dumping the waves because its special designs. 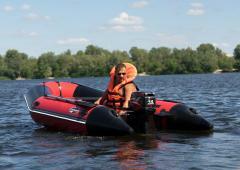 While you are riding this model the water splashes do not penetrate inside the boat due to the huge tubes diameter. You can take up to 8 people onboard to ride with a total weight about 950 kg. But if you go hunting or fishing - the best payload is no more than 6 persons. Seats' regulation system which provides personal installation for personal physical features of users. Protective handle which is located above the keelson air valve. 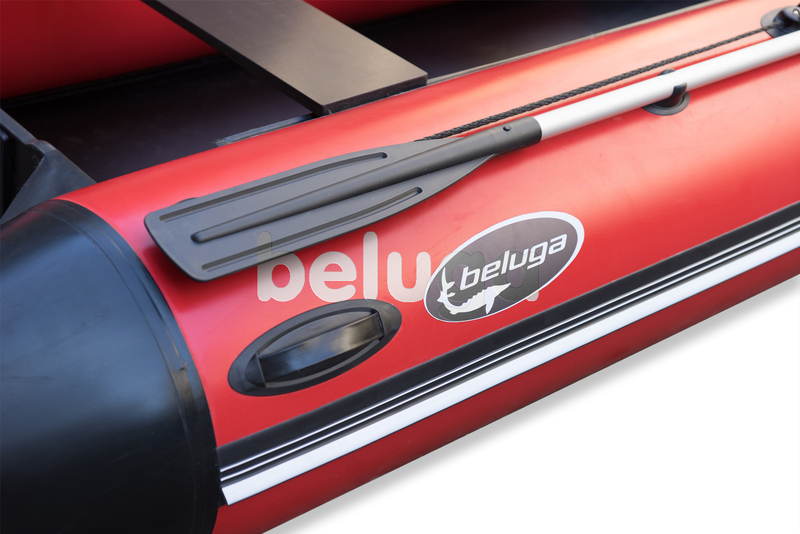 There are also a lot of other important features which can be considered as the good reason for Beluga K series inflatable boats selection. One of them is a special fabric which is used for the manufacturing. This material doesn’t decay, and it is fully resistible for ultraviolet, gasoline and oil. 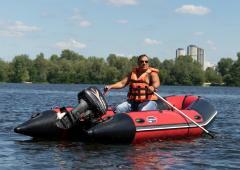 The other specialty is that Beluga K series inflatable boats are being produced by the welding technology. This way of manufacturing has a lot of advantages in comparison with the glued boats. The main of them is that the seawater bacterium destroys the glued frame. Beluga welded frame is the best way to avoid such problem. Beluga K series inflatable boats are characterized with the most comfortable and fastest ride in comparison with other models of this class. 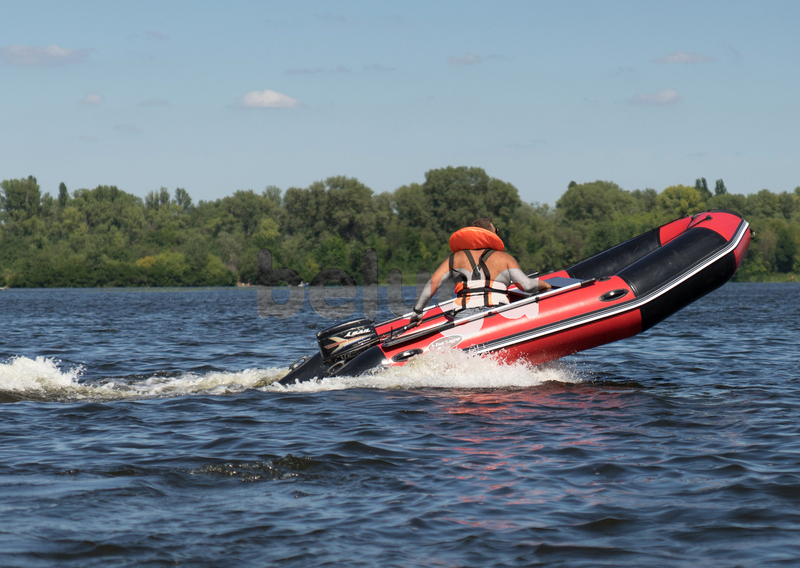 Original shape of the bottom, dead rise, dimensions of inflatable keelson, angles, turns, and some other features provide the most attractive technical characteristics. These boats have a rapid shape, they start the planning mode easily and, that's why, they don't need a powerful engine. 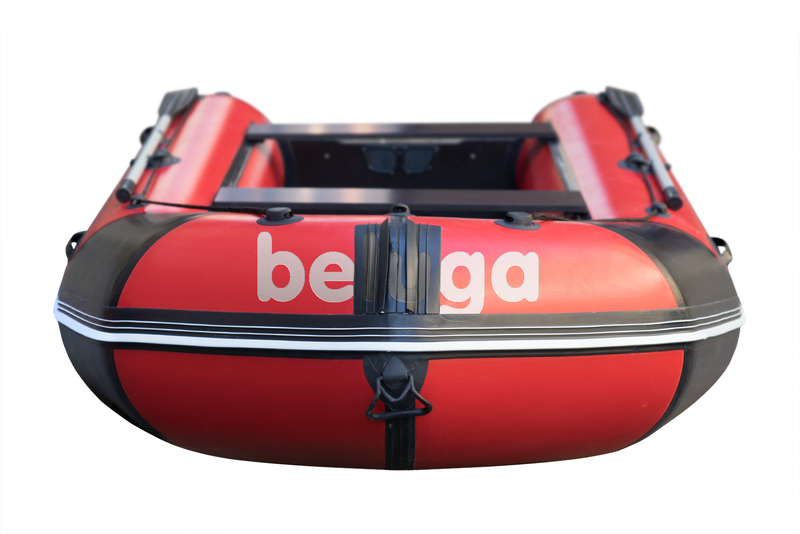 Any Beluga K series boat can reach up to 25 - Miles/h with the engine of 15 hp. I like to fish, and sometimes I should departure to the ocean on 2-3 miles from the coast. It is dangerous of course, but I know that in case of problems I can send SOS signal, and I will be found from far away, my boat can be seen without problems from the helicopter. It is very comfortable, that it helps my safety. The best frien for rescuer! Gordon Todd wrote that this boat is strong! I absolutely agree. And the fact, that it very helps me in my work. I work as the rescuer at the beach, and once when 3 persons sank, I could float on it and to save at once 3 people. I'm proud by this boat. It is really very big boat. I don't think about other manufacturers, but you, guys, could create big and at the same time qualitative boat. Can we wait for possible increase in the range in the future? Quality! I think this is the main advantage of this boat. I was with boat in difficult weather conditions. Once I have got to a storm, once I have hooked (but it isn't critical) on a snag at the bottom. The boat strong has sustained. I don't advise to arrange crash-test for it, but the fact it is strong - 100%. Balanced and easy to use board, I absolutely LOVE this board and have been recommending it to all of my friends. Sup inflates and deflates easily!